Please click on the link for a form letter that you are welcome to use to send to the State Board of Education. One is a Teacher Testimony and the other is a Parent Testimony. Each testimony can be downloaded and personalized. Please be sure to replace the yellow highlighting (at the top and bottom of the letter) with your personal information. All testimonies must be received by or before April 24, 2019. Remember – this is our last chance to appeal to the State Board. It will be another ten years before there is major review of Chapter 49. Please support us by advocating with written testimony to get the Montessori Teacher Credential recognized at the state level! Please note the schedule of meetings below. 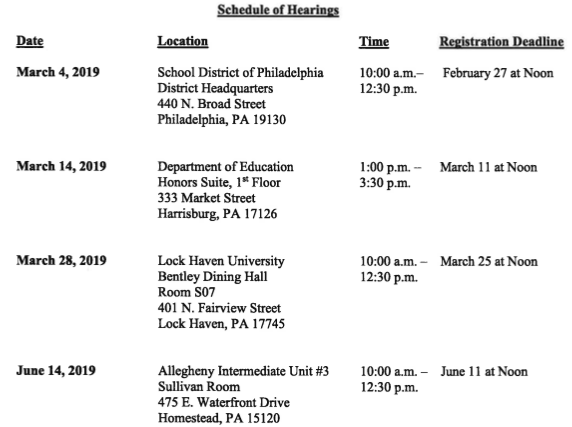 the April 23 meeting at Allegheny Intermediate Unit has been rescheduled to June 14, 2019. See below for details. Below are the documents to review to become familiar with the proposed amendments. Learning Policy Institute’s Report on Examining Educator Certification in Pennsylvania: Research and Recommendations for Chapter 49.